Do you have a plumbing problem? Do you want to solve it without having to spend hundreds of dollars? Calling a repairman is the obvious choice. There are other options including 'Fixing it Yourself'. This aticle on 'Do It Yourself Plumbing Repair' is designed to help you solve problems with plumbing and save a lot of money in the process. Below we have some 'Troubleshooting' information that should help you quickly locate your problem and find the right information. Read through the descriptions and click on the area that best describes your problem. When you arrive at the page you will find detailed information that will direct you to the righ solution to your issue. Why spend money when you don't need or want to? Consider the information below. The fuel that is used to heat water in most homes is either gas or electric. With that said, some problems are common to all hot wate heaters, no matter what type of fuel they use. Other problems are specific to the type of water heater that it is. Not sure what type of water heater you have? It is pretty easy to tell. Gas water heaters have a vent pipe, metal or plastic at the top that goes to the outside or into a chimney. The have a gas line hooked up to them near the bottom and you should be able to see a pilot light in the small access door at the bottom. Electric water heaters do not need a vent and they have an electric power line coming into the top. There are usually two access plates on the side of the unit. Sometimes these are a different color. Natural and propane gas are popular inexpensive fuels for water heating needs. However, gas is dangerous and can explode. Gas water heaters have built in safety features that keep this from happening. The problem is that they 'Err' on the side of caution. See the articles on 'Pilot Lights' and 'Gas Water Heater Thermocouples' for some of the common failures. This is certainly a popular topic. Toilet leaks, toilet tanks and toilet flanges are all things that will need attention. The good news is that most items related to toilets can be dealt with in a fairly simple manner. There are some things with a toilet that can have multiple issues. A toilet tank has more than one item in it th at could need attention. A 'running toilet' can be caused by one of two key components. Have you been able to isolate your problem. There are several individual items, such as the 'toilet fill valve', 'toilet flapper', 'toilet flush valve' and 'leaking toilets' that you may want to focus on. Are you facing the fateful, 'Toilet Clog'. You might develop of phobia about chewing your finger nails after this one (they say it is the first thing they teach plumbers). This home plumbing repair is not that terrible. However, you may want to consider wearing gloves. Water supply lines, drains and gas lines all fall into this category. Pipes include valves and adaptors that connect them to the devices they are serving. Leaks and clogs are often the culprits behind piping problems. 'Troubleshooting' plumbing repair problems is all about figuring out what the problem is before you spend time and money trying to resolve. This segment has more specific descriptions and provides links to many more articles. It is amazing how crippling it can be to your home when a drain is clogged. Boy, you never think about how nasty that water can be until it just sitting there staring at you. Is drain cleaning really a 'home plumbing repair'? Isn't it more like home repair torture. What kind of clogs can you get? How about 'kitchen sinks' and 'bathtub drains' for a start. See what you need to do by following these links. Some drains can be a big problem. However, most of the time it is not that difficult. Save the environment and stay away from the chemical drain cleaners. Learn a few tricks and you can deal with more than ninety percent of the drain clogs you will ever face. Got some issues with the plumbing on your drains. See 'sink drain plumbing' for the low down drains below the sinks. Bathtub drain repair has the goods on these hard to get to drains. Kitchens, bathrooms, laundry rooms and entertainment areas all have sinks. Faucets and drains are integral parts and also the cause of problems. Keeping the family clean these devices have sophisticated water supply valves and a drainage system. They are not as problem prone as other devices, but the do act up. At the top of each page we give you some quick evaluations of whether making a particular repair is really using common sense. In the end it needs to be your decision. After reviewing the information you feel comfortable making your own plumbing repair, go for it. Sometime you may need to buy a tool and some parts. Weigh those costs against the cost of a repairman. With a little determination you can save money and feel satisfied when you make your own home plumbing repair. 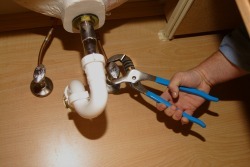 Home plumbing repair does require some specialized tools, depending on the scope of work. However, the majority of repairs can be made with a few simple tools that most households already possess. A screwdriver (one that accepts multiple tips) and a pair of adjustable pliers will make most of the repairs you will come across. See the tool suggestions for the basic tools to have handy, for your home plumbing repairs. Can you make your own home plumbing repair? In most situations, the answer is Yes! Make sure you are familiar with the steps involved. Obtain the materials and tools required before you start. Follow the steps and take your time and you will be successful. Do something you want to with the money you save.